Published by jalbertini on December 28th, 2015 in Sacred Mauna Kea, Social Justice, Take Action!, Vigil leaflets. on the Sacred Hawaiian Temple – Mauna Kea! In the Christian calendar, April 3rd is Good Friday, the day that commemorates Jesus’ crucifixion by the Roman Empire for the crime of sedition (stirring up the people). Good Friday is part of Holy Week that begins with Palm Sunday and ends with Easter Sunday, the day that Jesus rose from the dead. Also within Holy Week is the important biblical story of Jesus entering the Temple in Jerusalem and driving out the moneychangers who were exploiting the people and defiling the sacred place. This week, many Hawaiians and others are taking action to protect Hawaii’s Sacred Temple – Mauna Kea from further desecration – bulldozing for the $1.4 billion Thirty Meter Telescope – TMT, to add to the many telescopes already on the sacred mountain. Hawaiians are asking that their spiritual beliefs, religion, culture, and traditions be taken seriously. They are saying enough desecration. The sacred must come before dollars, jobs, etc. They are saying that Mauna Kea is not a commodity. 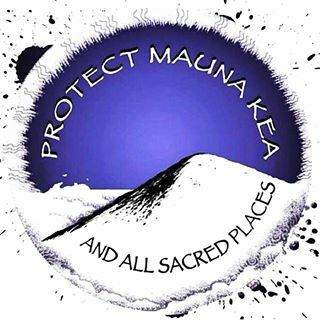 It is time to honor, respect, and protect Mauna Kea. It is time for aloha ‘aina to be the guiding light for Hawaii and the world. Aloha Mauna Kea! Or Don’t We Care? Has Money Become Our God? It is time for Hawaii and our world to affirm the sacred over science, environmental preservation over further industrial development. It is time to restore our balance with nature, to become pono. We have become so far out of balance that it is difficult for us to see clearly, to see ourselves as we truly are. In many ways, we have become military/industrial drunks, believing that one more military/ industrial drink won’t hurt us, one more for the road. One more for jobs, one more for “full spectrum dominance” and world class astronomy.